Sunday service from 9:30 – 12:00. Awana meets Tuesday nights. Sunday school alternates between age oriented classes and electives. Currently, we are in age oriented classes. Our younger adults are in a class about Temptations and our older adults are in a class about “Power”, i.e. power of prayer, Holy Spirit, etc. After this series, we will break into our 5 week electives again. 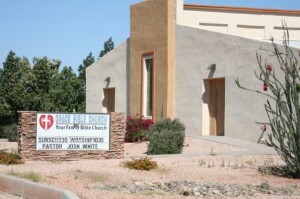 We also have children’s ministries and nursery on Sunday mornings as well. Wednesday morning is men’s bible study and we are currently studying the book of James. Ladies Wednesday morning Bible study meets at 7am at Judi Kemper’s house. The women also have their quarterly events planned by our women’s ministry team. Women’s bible study meets Wednesday nights and is doing a study called “Devoted Bodies” about eating healthy, exercising, etc. Our youth group, known as the [JUICE CREW] meets Wednesday nights as well and is currently doing a series called “Christlike-ness” They also meet Sunday mornings. Our motto is Come. Grow. Go! and we’ve based our ministry on Colossians 1:10. College group is called Illuminate and is the Go! end of the youth group. Currently studying 1st Peter. We currently have small group leaders (older adults) from the church that are running small groups in their homes and/or coffee shops, and relating the basic truths from 1st Peter to everyday struggles college students have. We have monthly events and quarterly ministry projects. We’re participating in a “Feed My Starving Children” food packing event in May. Our focus is mainly on building relationships in the church with old adults and getting college students to root their identities in Christ an later possibly serve in the church or another aspect of ministry. Vacation Bible is starting June 23rd. We’ve also undertaken a social media campaign and have been intentional in building a website and social media network that works together to communicate between ministries and reach people in the community. We’ve had quite a few families visit based in seeing our website and social media, and can see that we are a busy church with a lot of ministry options.